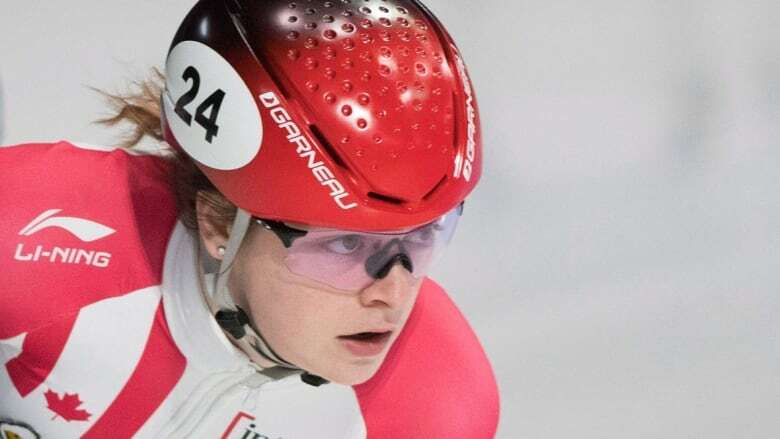 Canada, led by ​Kim Boutin's gold medal in the women's 1,000 metres, ended the final short track World Cup event of the season in top form with four medals on Sunday in Turin, Italy. ​Kim Boutin and her Canadian teammates ended the final short track World Cup event of the season in top form on Sunday in Turin, Italy. The 24-year-old from Sherbrooke, Que., won the women's 1,000 metres in one minute 32.508 seconds to defeat Korea's Jeong Choi Min (1:32.814) and teammate Alyson Charles of Montreal (1:32.891). "I skated a good race and am starting to have a lot of different strategies in my tool box," Boutin told Speed Skating Canada. "Reaching the podium with another Canadian is also extra fun. Alyson skated well this weekend so I am pleased to be bringing home a medal with her." Said Charles: "I train with Kim so it was very special to skate with her in the final. We each had our own plan and we applied them our way during the race. I'm very happy to have had the chance to stand on a double Canadian podium." Also reaching the podium for Canada was Steven Dubois with a bronze medal in the men's 1,000 and the mixed relay team of Courtney Sarault, Boutin, Charles Hamelin and Sam Girard, who covered 2,000 metres in 2:40.614. Canada will leave Italy with 24 medals from World Cup action this season as eight different athletes and all three relay teams have reached the podium since November. On Saturday, Boutin captured speed skating bronze in the women's 500 A final, clocking 44.184 seconds after being called back to the line three times to restart the race at Tazzoli Ice Rink. Last weekend, she won silver in the women's 1,500 in Dresden, Germany. Dubois stopped the clock in 1;27.583 in the men's 1,000, trailing the Korean tandem of Dae Heon Hwang (1.27.257) and Ji Won Park (1:27.494). The native of Lachenaie, Que., was fresh off a bronze performance in the 1,500 A final on Saturday. Dubois also recorded a fourth-place showing in the 1,500 A final on Feb. 2 in Dresden. Cédrik Blais of Châteauguay, Que., was third in Sunday's 1,000 B final after winning bronze in the 500 A final the previous day. Pascal Dion, Montreal: Fifth in men's 500 semifinals (2). Courtney Sarault, Moncton: Penalized for arm block in women's 500 (2) quarter-finals. Charle Cournoyer, Boucherville, Que. : Fifth in men's 1,000 quarter-finals. Claudia Gagnon (Saguenay, Que.) and Kasandra Bradette (St. Felicien, Que. ): Second and third in women's 500 repechage semifinals (2).